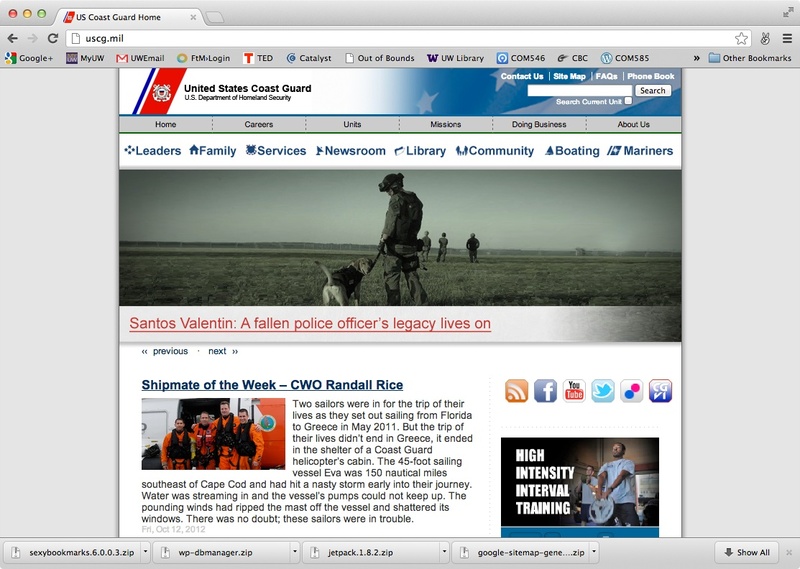 United States Coast Guard’s main page for the entire service. Established in 1790, the Coast Guard is the country’s oldest sea going armed service. The webpage changed to it’s current version in the last 3 years, to highlight the Coast Guard Compass, the official service blog so that the page is not constantly static. The site is in English. There are two navigation bars across the top, a scrolling picture/article bar underneath. There are social media links. At the bottom of the page there are picture links that lead to different sites including sites that are internal and only accessible to service members. The links on lower of the two bars often lead to pages outside of uscg.mil. Each page that you link to from the top bar are set up relatively similar with a main column to the right and a series of related links in a column on the left. The public that the Coast Guard serves, other government agencies, tax payers, and potential recruits. There are also a number of links that are targeted at currently serving members and employees. To be a one stop location for service related information, service member stories, and links to all the units in the Coast Guard both for the public and personnel. There are links for an RSS feed, Facebook, Youtube, Twitter, Flickr, and CGVI that all lead to Coast Guard sites on each.